Starting in town, you’re just a short distance — in any direction — to northern Michigan’s most treasured hiking spots. Though there are a lot to choose from, these top three treks offer the best scenery at varying levels so all can enjoy. From paved, wheelchair-accessible scenic trails to sandy and strenuous climbing adventures, Empire has something for everyone. Treasured by locals, the Sleeping Bear Heritage Trail provides over 20 miles of paved pathway through gorgeous hardwood forests. 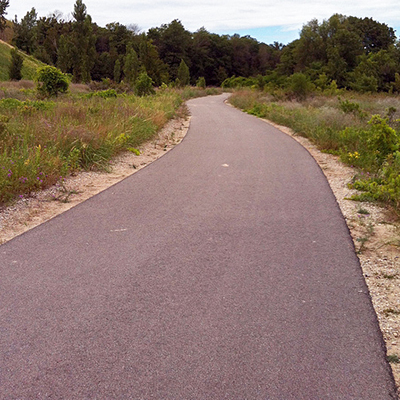 Though some sections are hilly, the majority of the trail is flat enough for all ages and abilities to enjoy on foot, with a stroller, or wheelchair. Time commitment: From a few minutes to a full day, depending on how far you want to go. Getting there: Check out maps on the Sleeping Bear Heritage Trail website to choose your trail section. Tips: Bring a picnic and have lunch in the shade at the bottom of the Dune Climb. Accessibility: Both pet and kid-friendly. Easily accessible to those with disabilities. Just south of town, take a hike up what’s considered the most gorgeous trail of the park, Empire Bluffs, to catch a glimpse of the iconic view that has inspired countless paintings and postcards. At 1.5 miles round-trip, the hike is hilly but can be easily conquered in under an hour, even with little ones in tow. Activity level: Moderate. Some uphill, but short. Time commitment: Plan for an hour. Or two—if you bring a picnic. Getting there: Just south of the village of Empire, the trailhead has easily-accessible parking. Tips: Be ready for photos. This hike gives you the best view of the park. Accessibility: Both pet and kid-friendly. For those with disabilities, plan at your own discretion—some steps, uphill climbs, and sandy areas occur. Make your day an adventure by climbing up the park’s largest dune, hiking the shoreline, and ending at a ghost town. 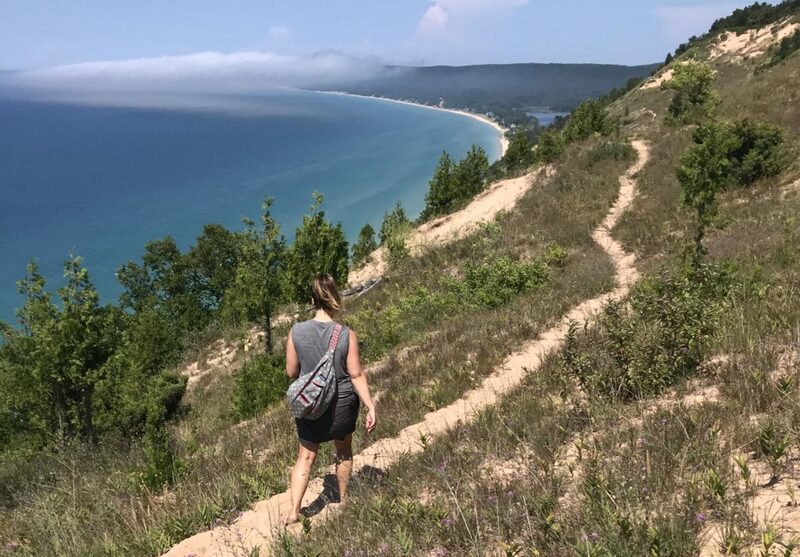 Starting at the famous Dune Climb, hike to the top of this gigantic sand hill—don’t forget to take in the stellar view—and follow the trail all the way to Lake Michigan. From here, turn right and follow the shore north (and eventually east) along the tip of the Sleeping Bear, finally ending at historic Glen Haven beach. You’ll likely have most of the hike to yourself, just be sure to be prepared with plenty of water and good shoes to enjoy it. Activity level: Strenuous! Sandy, some uphill, and often hot. Time commitment: Plan for about half a day. Getting there: Before starting at the Dune Climb, drop off some bikes in Glen Haven so you can ride the Sleeping Bear Heritage Trail back to your car. Tips: It gets hot! Bring water, snacks, sunscreen, and good shoes. Accessibility: Not recommended for pets, children, or those with disabilities. Is solo your style? 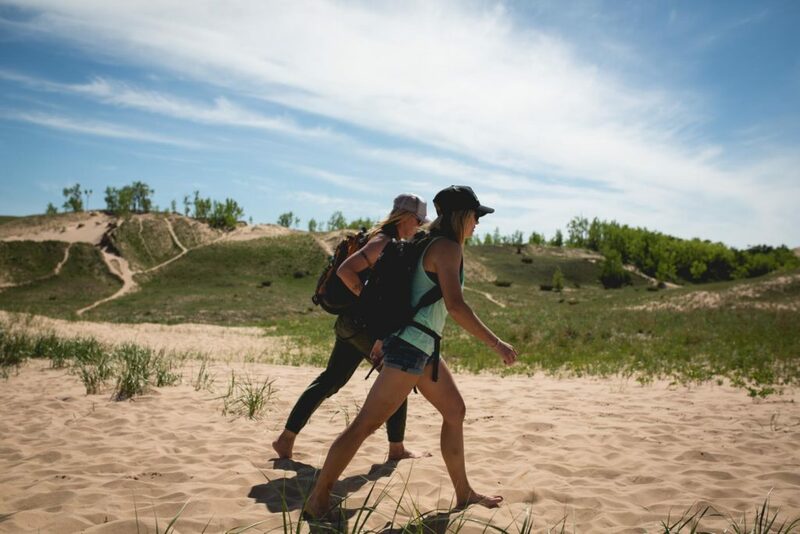 These lesser-known trails offer up some of the best dune hiking in the park, but being off-the-beaten-path means they are far less traveled. Each trail ends up at a secluded, dune-enclosed beach that’s often yours to enjoy alone. History buffs will want to explore this trail system winding through the Port Oneida rural historic district. Featuring a collection of preserved family farms, a schoolhouse, and cemetery, the trail also boasts some breathtaking scenic views. Looking to get lost? With 15 miles of hiking in this looping trail system—and a few stops at the beach—it’s easy to make an entire day out of your trek into these deep woods. Aside from Empire Bluffs (arguably the best view in the park), both Pyramid Point, which offers an expansive view to the north, and Cottonwood Trail, which connects to the Dune Climb, deliver big on breathtaking panoramas. Because of their iconic views, they are often more crowded.